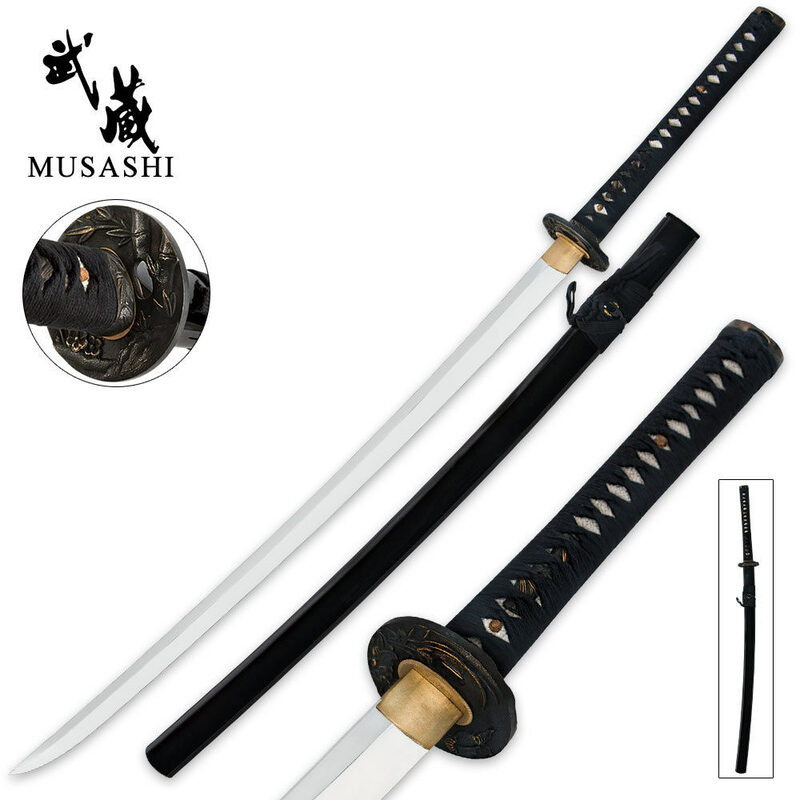 Musashi Floral Design 1060 Carbon Steel Samurai Katana Sword | BUDK.com - Knives & Swords At The Lowest Prices! 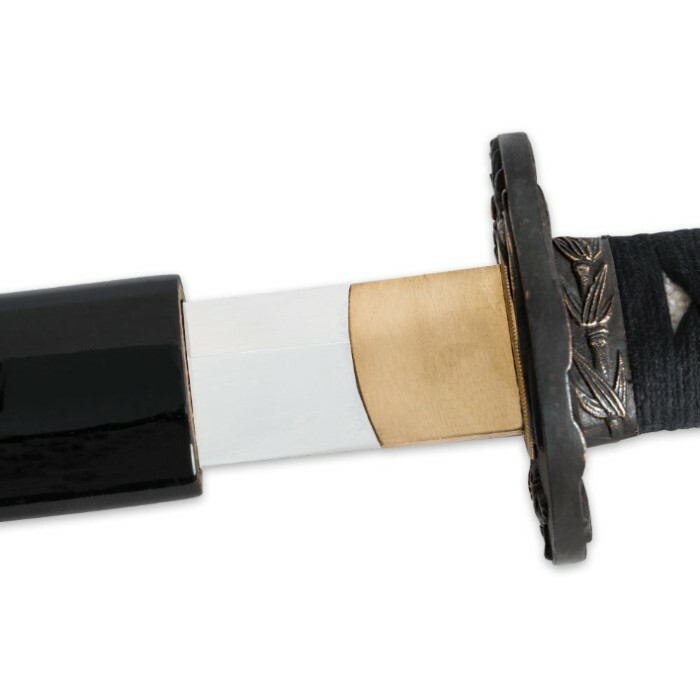 This Musashi samurai warrior katana sword features a hand-forged and sharpened 1060 high carbon steel blade with a fuller groove. It comes to you honed to a razor's edge right out of the box. The antique-finished brass tsuba features a beautiful floral motif. Other brass accents include a habaki, menuki and kashira. The handle is encased in genuine white ray skin with black cord wrappings. A carefully hand-painted scabbard houses the 27-1/2" blade. After seeing all the great reviews for Musashi I decided to buy the Flowering Bamboo and I have to say I'm kind of disappointed in this one. Mine came with a slight nick in the blade (nothing major), a very spotty sharpening job (some parts of the blade are pretty sharp while others not so much including about a 6 inch area from the habaki that has no edge at all), the kashira is a little loose (not too bad but I'm afraid that it may fall off eventually with much use), and the tsuba sits a little crooked. Judging by other reviews for Musashi I'm sure that this is a rare occurrence and probably just one that slipped through QC. I haven't cut anything with this one yet because I'm still trying to decide if I want to go through the process of returning it. It's not all bad though. The sword has a nice weight and balance with the no bo-hi blade. Mine has a nice pronounced hamon. It also has nice detail in the tsuba and kashira. The ito is tight and has held up well so far though my handling and practice swings with it. It has a different shaped kissaka than most katana you see. The tip is keener and comes to a sharper point. More of a Hira-Zukuri style judging by pictures that I've seen. True Swords was also really fast with the shipping. If everything was right with mine this would definitely be a 5 star review as it is a beautiful sword. I guess I just got one of the few lesser quality ones from Musashi. This was my first Musashi, and I am very happy with the sword. As other reviewers have said, it's got a great weight, a pronounced hamon, and came very sharp. I have had several comments on how good the blade looks and feels in the hand, and I couldn't be happier, especially for the price! This is my first Katana, but from what I can tell it's top notch. Very sharp, good weight, feels perfect in hand. The hamon is subtle, but nicely done. And the letter of authenticity, with the marks of the craftsmen affixed, is a nice touch. I specifically wanted a Katana without Bo Hi, which proved more challenging than I anticipated. Materials are excellent quality, just as described. Shipping was fast, secure and product arrived in perfect condition. Highly recommend. True swords service was amazing. Got the sword very quickly and without any problem. Everything is as described in the product info. Know the price I would guess it cost several hundred $ . Wanted to do an updated review for 2014 on this wonderful sword. I've had mine for about 2 weeks now and It is still just as beautiful and deadly as when it arrive. Any Trueswords regular doesn't need to be told shipping was excellent, timely and secure. 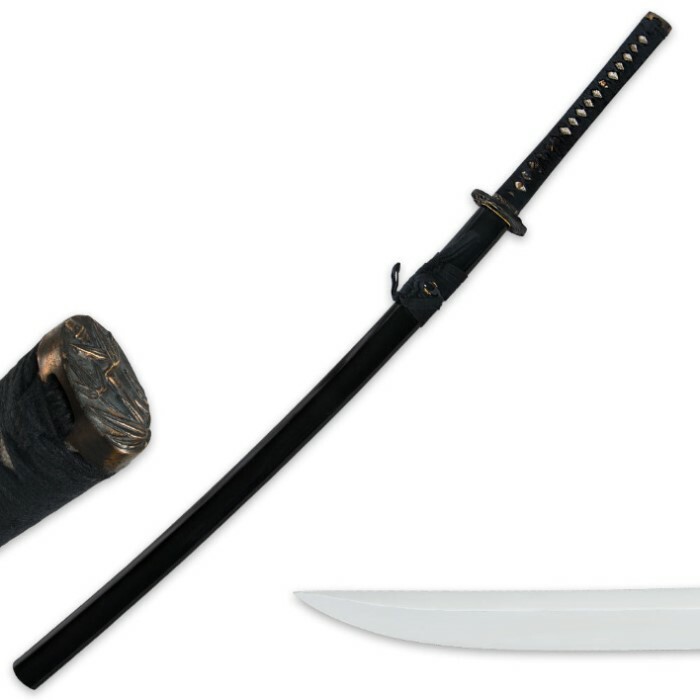 I was interested in seeing what the no bo-hi musashi swords could offer and I'm thoroughly pleased. It is strong and durable. The blade and Tsuka are longer than the other swords I own and it feels like a bit different style is needed but effective no less. After some good use put into it I'm here to say this thing is razor sharp and can hold an edge very well. It handles light targets like pool noodles or water bottles great and for being unfullered I love the blade geometry as it is not hindersome going through lighter targets. I don't encourage you attempt it but I live in a rural area and there are tons of tall grassy stalks and weeds and it was very fun getting used to this beauty. It even handled softwood saplings with easy, and no damage to the blade that i detected, only needed to be cleaned and polished after. Beautiful sword, great price for what you're getting. Don't hesitate or they'll raise the prices again! beautiful blade. i fell in love instantly.the hamon is gorgeous. DEFINITELY satisfied. true swords is awesome !!! !